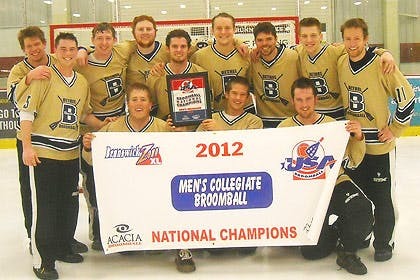 May 2, 2012 | 9:36 a.m.
Bethel's national champion broomball team. 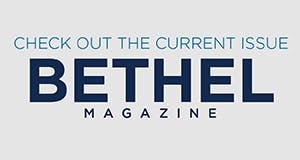 The Bethel Club Broomball Team recently won nationals for the second year in a row, beating Northwestern College 2-1 for the championship by scoring the winning goal with less than two minutes left in the game. More than 60 teams, including the University of Nebraska and North Dakota State University, competed in the men’s collegiate level national tournament, held this year at Blaine SuperRinks, Blaine, Minn. While 12 players competed in the tournament, Bethel’s thriving club team consists of more than 30 players. “Many of us have been playing on the club team since freshman year, so we not only have a comfort level on the ice, but we are confident in our abilities as a team to overcome any challenge,” says Jimmy Pate, a team captain. This year, the club team had a long season, starting in October with a tournament in Omaha and continuing until their championship run at the end of March.